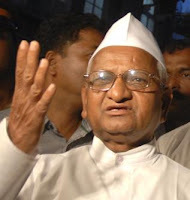 Arresting the Gandhian, Anna Hazare who is determined to discourage corruption in the country much before he could go for a hunger strike shows the fear in Government of loosing control. Arresting him at 7:30 in the morning from his Mayur Vihar, Delhi residence and then deciding to release him taking a U-turn shows the nervousness in the Indian Government. As Anna refuses to come out of jail even though the Police has dispatched the release, the public and the media awaits the Government’s justification on Anna’s detention which has created the doubt on the democracy. With the release, government has given two options to Anna: either finish the fast in 3 days or go back to his village. Anna is demanding unconditional release for fasting at JP Park in Delhi. Government’s pendulum action has created much more trouble for themselves as the protest has spread all over the nation. People holding India’s flag came out on the street to show their support for Anna proving that the movement is not backed by political elements. Holding the flag of India the protesters showed that they are with India, but the government is not.